You don’t have to be Jeff Bezos to know the world of retail is changing fast. With the rise of click and collect, robot workers and drone deliveries, retailers have new technologies changing the very essence of how we buy and sell. In the inherently hectic world of retail, it’s hard enough to keep up with day-to-day data demands, let alone make informed (and of course, PROFITABLE with a capital ‘P’) decisions about where to invest and expand. There is a way — or actually, four ways — to leverage your data and see with total clarity which strategies are right for your retail business. Dashboards with valuable yet easy-to-digest data visualizations reveal key insights to internal stakeholders and decision-makers. 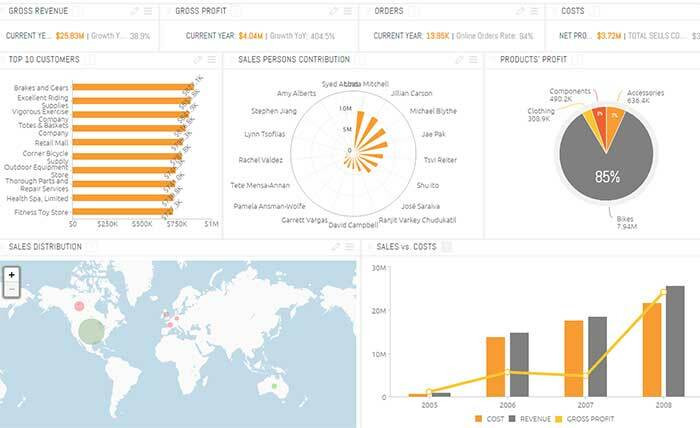 Here are four retail dashboards you can start using today to streamline your data and get the buy-in you need to outrun the competition. Ask your average retailer what their top selling product or store is, and you’ll have no problem getting an answer. But try to maximize margins across the distribution network, and things get tricky. If you’re a retail organization serving multiple markets, you need a deeper, wider view of what’s selling well and where. The Retail Distribution Management Dashboard gives you the full picture. Measure product sales at each distribution point by condition, rep, ROI on incentives and more. Get profitability insights from different angles such as Sales vs. Cost and Year on Year. Use the interactive map to spot growth markets and navigate from location to location with a click. Compare online vs. offline orders to see where and how your omnichannel strategy can improve. This dashboard works with a variety of sources including sales orders, product categories and subcategories, and special offer and entity IDs. Worried about fragmented data sources? Don’t be. Just make sure you choose a powerful Business Intelligence tool to ensure that your Retail Distribution Management Dashboard covers disparate data sources throughout your entire distribution network — no matter how vast or diverse. Niche branding and shopper personalization are some of the most effective strategies helping modern retailers stay ahead of the competition. According to a survey by Virtual Incentives, 56% of consumers said receiving a personalized incentive would improve consideration of the brand. But you need to track the data closely to determine which efforts are actually yielding ROI and adjust your marketing strategy accordingly. The Retail Analysis Dashboard tells you everything you need to know about brand performance within diverse buyer segments and gives you a deeper understanding of what is and isn’t working in your sales funnel. Quickly compare brand performance across product lines using detailed sales data. Understand the impact of product condition on brand sales. Unlock key market insights with metrics like regional cost breakdown and consumer age range. View profit breakdowns across demand stages to remove bottlenecks and improve conversions. As with the Retail Distribution Management Dashboard, with the right BI tool, this dashboard brings together data from a wide variety of sources and can even link directly to supplier data, bridging the gap between sales and inventory. 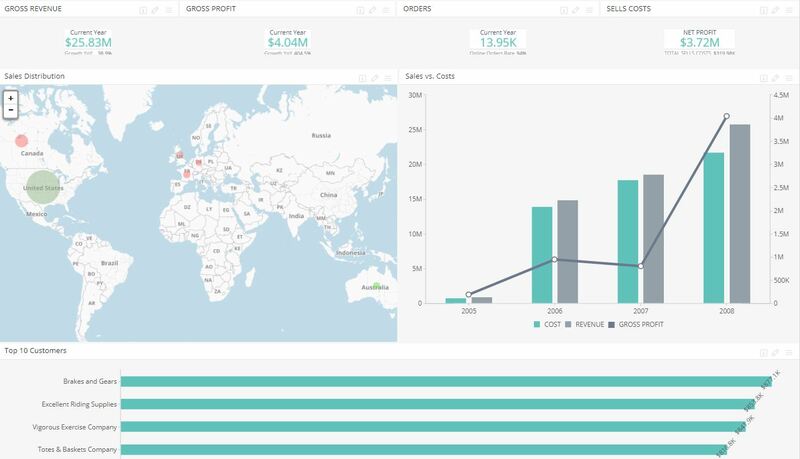 With user-friendly data visualizations, your conversations with sales and marketing just got a whole lot easier. Expanding into online can be a risky proposition (looking at you, Webvan). But with retail e-commerce sales expected to reach $4 trillion by 2020, the opportunities are undeniable. Online retailers in virtually every industry are taking advantage of profit-driving technology such as customer service bots, and Artificial Intelligence powered digital assistants and a plethora mobile shopping apps. Do you have a clear analysis of your current e-commerce strategy? The E-Commerce Dashboard template lets you know where your business truly stands with your e-tail efforts and make informed, data-driven decisions to build and grow new revenue streams online. 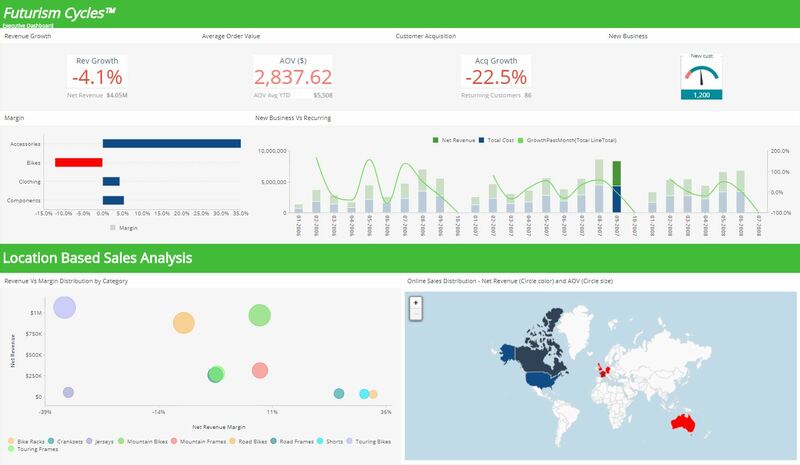 This dashboard connects directly to your growing e-commerce site and gives you all your essential data in charts, graphs, and reports that can easily be adjusted to fit your e-commerce analytics needs. Now you have everything you need to make a compelling case to internal stakeholders and set yourself up to accurately measure e-commerce ROI. There’s not much you can do without C-level buy-in. And the same is true for pretty much every team in your retail organization. Which is exactly why upper management has no time for lengthy meetings or manual reports. This template was built with top execs in mind. It gives you everything you need to show your busiest team leaders fast, real-time insights into your organization’s strengths and weaknesses. As you would expect, this dashboard works with many different data sources. So choose freely, but wisely. The Executive Dashboard makes retail analytics as short and sweet as an elevator pitch, but you need to know what they’ll ask before they ask it if you want to make it as effective as possible. You’ll definitely want to try this one out before your next meeting with the CEO or VP of Sales. Retail dashboard templates help you cut through the chaos and quickly leverage large datasets to make timely, relevant business recommendations and help your teams understand what will and won’t work as the retail business continues to transform. These are just four of many fantastic retail analytics dashboards that can help you translate strategy into measurable actions, and vise versa. In fact, there are Business Intelligence tools specifically designed to meet the needs of retailers. Learn more about how retail analytics can transform your business here.